Jay Earley knows what makes a caretaker tick. In Beyond Caretaking, he has named what goes on inside the caretaker–the mechanisms and triggers that lead to an unhealthy caretaking mode and the motivations behind them. One important insight is that when I come from unhealthy caretaking, it doesn’t serve the person I’m trying to help and can even feed their unhealthy pattern, their addiction. That alone is worth the price of admission. The book helped me to see that I may be inviting unhealthy people into my life because of this pattern, and the consequences for me are resentment and fatigue. All this was written in a way that was sensitive to my experience as the reader. The book outlines solutions systematically and provides easy, step-by-step instructions to follow to create changes in this pattern. Bottom line–it is a very thorough, effective piece of work. 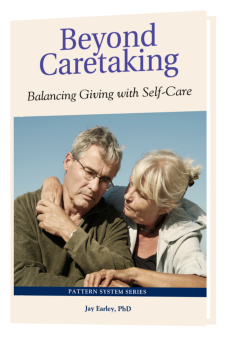 Beyond Caretaking helped clarify the dual nature of caring and caretaking. The workbook further clarified which activity I am prone to. This clarification made it easier to choose a more healthy pattern of behavior without being tripped up by guilt. Earley’s arguments for caring vs. self-care are reasonable, sensible, and resonate internally. He presents his perspective on the link between present actions and childhood wounds in a very gentle manner that educates without filling the reader with regret and desire for avoidance. The book is simple, whetted my appetite to know more about the Pattern System, and kept me engaged enough to finish it in one setting. I found Beyond Caretaking well worth spending time with. I learned a lot about myself, particularly why I am a caretaker in the first place. It helps you to become aware of what triggers you to jump in and take care of everything. The process of changing and developing self-care is broken down into easy steps that I found very useful.